Great Backyard Bird Count (Friday, Feb 17th thru Monday, Feb 20th, 8:00 am to 5:00 pm) The Great Backyard Bird Count http://www.birdsource.org/gbbc is a great opportunity for beginning and expert birders across North America to enjoy and record a variety of birds. This is a self guided event where participants can take as little or as much time as they wish. The York River shoreline, Taskinas Creek, and our miles of trails provide excellent birding and other mid winter adventures. Amazing habitat along the Chickahominy River and Gordon’s Creek. The park has a wide variety of areas to view tidal streams and rivers. During low tide, mudflats may reveal a variety of marsh birds. Beyond the park, Osprey and Bald Eagles nest along the shores and rookeries of Egrets and Great Blue Herons are found in the nearby swamps. This passive park located near downtown Williamsburg features a lookout tower and marsh walkway through College Creek for viewing a variety of birds and other wildlife. A 23-mile scenic byway that connects Jamestown, Williamsburg and Yorktown. Numerous pull-offs are located along the route, and more than 200 species of birds can be seen in its varied habitats. More than 200 species of birds have been seen here, and hikers can view the area as Native Americans and early colonists did when they arrived in 1607. Look for nesting Osprey, Warblers, Woodpeckers, Swallows, and more. Historic Jamestowne is located on a low-lying island vegetated with short grasses and open woodlands. It offers the birding fan salt-marsh, piney woods, riverside and pond habitats. Great for year-round bird watching, as well as fishing and boating. This scenic park overlooks a 996-acre reservoir. The mature forest, ridges, bottoms, plants and wetlands of this 545-acre park provide habitat for a variety of wildlife. The Virginia Birding and Wildlife Trail program has recognized the park as one of coastal Virginia’s best sites for birding and wildlife watching. 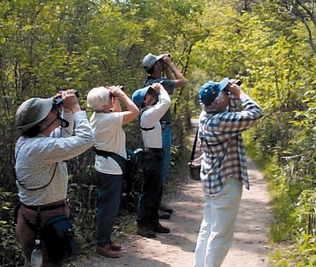 Contact the park office for the schedule of nature and bird watching programs. Scenic views of tidal marshes and an abundance of wildlife highlight trips on this beautiful waterway. Facility consists of a small non-motorized boat/canoe/ kayak launch with parking for 20 vehicles, and five observation/fishing piers. Picnic areas and trails through mature woods are excellent for Thrushes, Vireos, Warblers, Flycatchers, Tanagers, and more. York River State Park offers visitors an opportunity to experience the environment of a coastal estuary. This park is known for its rare and delicate environment, where freshwater and saltwater meet to create a habitat rich in marine and plant life. Expect just about any kind of birds except shore birds. Driving or walking throughout this historic battlefield with its open mowed fields and riparian woodland trails, birders may expect to encounter woodland birds and species that favor the open grasslands. Whitetail deer, groundhogs, and squirrels are also plentiful and conspicuous. Enjoy woodlands birds, waterfowl and other wildlife along this three-mile trail winding through forests adjacent to the Williamsburg home of John D. Rockefeller, Jr.